Chromium Comic Book Covers…In 2013? Yes. The holographic/shiny/magic foil covers are back. 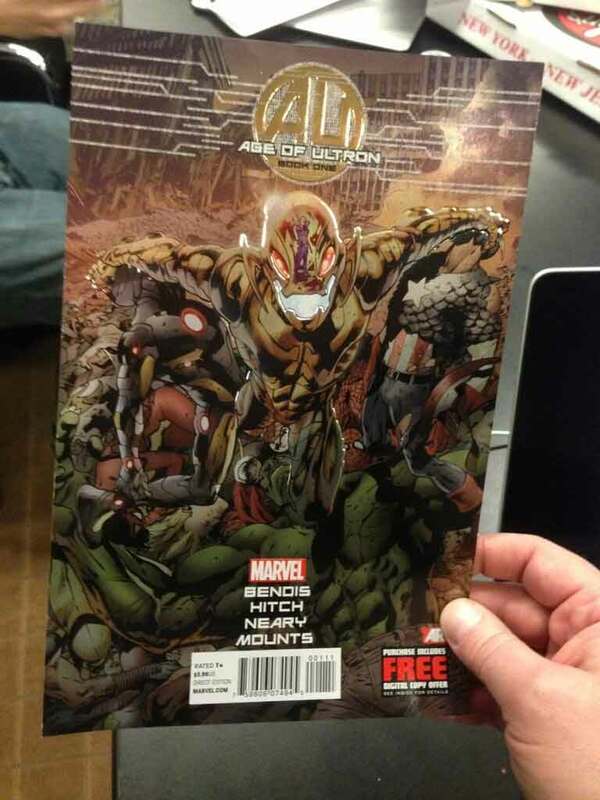 Brian MIchael Bendis tweeted this picture today of the upcoming chromium cover version of Age of Ultron: Book 1 and it brings back memories of the “OMG everything is a collector’s item” zeitgeist of the 1990s. If you weren’t following comics during that period, you really missed out on some craziness. Comic book sales were near an all time high, not necessarily due to the comics themselves being all that great or due to people really enjoying comics that much. The comic book market had been taken hostage by speculators–people buying comics in bulk in the assumption that they would be able to flip it and turn a monster profit. The publishers were more than happy to placate them, with all kinds of gimmick stories (ranging from the Death of Superman to title relaunches) to placate them. They also created what felt like a million different types of covers–hologram, pop-up, and even a Colorforms type–to get people to buy more comics. Although it was a great idea at the time, it almost killed the whole industry by the later part of the mid 1990s when the speculators realized that they couldn’t charge a premium for something that had a print run of over 500,000. So with Marvel bringing back the chromium for this is truly for novelty sake. When each publisher has ten chromium covers a month, then we can panic. This entry was posted in Uncategorized and tagged 1990s, chromium, collecting, comic book market, comic book sales, comics, marvel by Chris. Bookmark the permalink. I remember having a chromed out Avengers book with Exodus on the front.X-Men appeared in that issue as well. I remember that crossover! It was during the phase where to be edgy, all the Avengers were wearing edgy military/leather jackets and Black Knight had the Don Johnson-beard!